The invite said vintage, so I did my best with what I already had in my wardrobe - this pink Warehouse dress is vaguely 20s (I also featured it here), especially teamed with the headpiece I took home from The G, and a fur collar that used to be part of my mum's old winter coat (sorry Mum!). 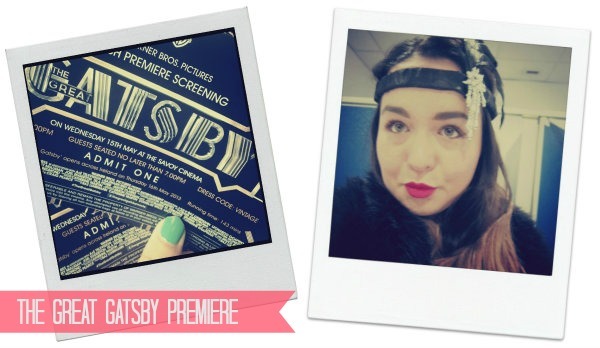 But one look at the full on ritzy, glitzy flapper style at the premiere made me wish I'd made a little bit more of an effort. In an ideal world I would have loved to have rocked up in any of this little lot. ONE These gorgeous Cai heeled metallic sandals are the very thing for trying out the moves of the Charleston. The heel height looks just about do-able, too. TWO With its detailed embellishment and beading, this Miss Selfridge flapper dress looks decidedly more high-end than high-street. THREE I'm a little bit in love with this black, white and gold necklace - the cord reminds me of one of my current favourites. FOUR For a more modern take on the 20s trend, this bejewelled dazzler of a top from Choies would look great, teamed with jeans and those high-heeled sandals. FIVE Crystal encrusted earrings with a dangling pearl? Bling me up Scotty! And unlike Daisy's, these Miami ear-rings from Monsoon are costume, so you can afford to really pile it on. SIX Part of Topshop's Limited Edition collection, this sequinned black number will make sure you shine! SEVEN Deco and decadent, at £55 this rose gold and crystal necklace is a little pricier than your normal highstreet find, but boy does it make a statement. EIGHT This beaded clutch looks vintage, but is an absolute steal from New Look. Have you caught Fitzgerald fever and is anything catching your eye? That Miss Selfridge dress is calling my name....damn you Emma, damn yooouuu. Such a pretty post! I definitely have Fitzgerald fever and I want all of the things here! I dressed as a flapper once. Not nearly as exquisite as these designs. I'm posting about it tomorrow. Glad you got to see the movie. LOVE the sequinned black Topshop dress! Loving all your jewellery picks Emma. Love the jewels and that t is so cool! These are fabulous items, I love flapper dresses but I don't think they would suit me. I loved the movie! In love with that rose gold and crystal necklace! I love the 20's style and all of Carey Mulliagn's dresses looked amazing in the movie. You look lovely dear and the New look clutch is divine! im so loving the headband! Love your choices Emma, I adore the Deco aesthetic and actually went to a 20s themed party before Christmas and had so much fun dressing up, especially doing a faux-bob! The necklaces in particular are gorgeous. Still haven't seen the film, but hoping to next week when I'm less busy! Great look of yours! I was going to see the movie yesterday but then got caught up on my home renovation. Will probably watch the movie on Saturday. I love the clutch, so bling yet elegant!